What are species banks and habitat exchanges? Species banking is an approach in which landowners earn credits for conserving habitat on their land for specific species of concern. These credits can then be sold to other landowners or organizations that need to mitigate negative impacts to habitat as a result of development or other activities. In most species banking arrangements, the landowner (or bank developer) negotiates directly with the credit buyer and regulators oversee the bank. The first species banking policies were established over twenty years ago in California, and in 2003 the U.S. Fish and Wildlife Service created a guide for establishing and using species banks. In a variation on species banking, habitat exchanges extend mitigation efforts to a broader landscape that allows multiple landowners to develop and sell credits to multiple buyers. An independent administrator then monitors and verifies the credits sold to ensure the integrity of the exchange. The habitat exchange concept was put to the test in southwest Utah in 2011. The Utah Prairie Dog Habitat Credits Exchange was established to preserve Utah prairie dog habitat, a species federally listed as “threatened.” Roughly 70% of remaining prairie dogs live on private land, so the goal was to work with landowners to compensate them to conserve already existing habitat. Initial funding came from the Natural Resource Conservation Service and the Panoramaland Resource Conservation and Development Council (PRCDC) serves as the administrator. At the beginning of the program, landowners were paid from $1,000-$2,000 per acre to set aside at least forty acres with at least twenty prairie dogs on it. The number of credits created is calculated by considering the number of prairie dogs present and the quality of the habitat. These credits can then be bought by developers to offset the loss of prairie dog habitat from their developments. In the first years of the program, prices ranged from $4,800-$8,000 per credit, but were available in 2016 for $800. Once the land is conserved in the program, biologists and farming experts advise landowners on the best management practices to ensure that the prairie dog habitat is properly maintained. PRCDC is responsible for monitoring agreements with landowners and ensuring that habitat is conserved. A key component of the program is that the exchange administrator serves as a broker, thus removing delays from permitting and the risks of negotiating the credits independently. Species banking and habitat exchanges illustrate how conservation can incentivize the protection of threatened and endangered species on private lands. "Species banking and habitat exchanges illustrate how conservation can incentivize the protection of threatened and endangered species on private lands." 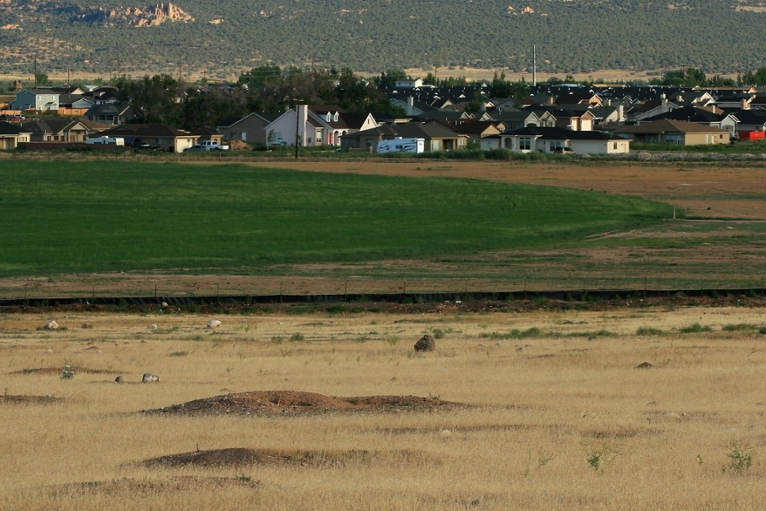 A prairie dog colong nested in a field amidst the suburbs in southwestern Utah. Photo: Brian Slobe. Carroll, Fox, and Bayon. (2008). Conservation and biodiversity banking: A guide for setting up and running biodiversity credit training systems. Earthscan: London.